Bullet Pen with .308 Win Lapua Brass is a great gift for shooting, F Class rifle shooters, hunting, and 2a enthusiasts. These are made from BRAND NEW .308 Lapua bullets are carefully machined into a beautiful bullet pen for you or your shooting or hunting buddies with copper accents for a more authentic looking bullet pen. My pens use a bullet style tip and not a common pen tip for more authentic look, full size copper center band, and copper pocket clip. These are made from NEW brass. I hunted for the best looking brass I could find for those that were requesting a non-fired bullet pen and I settled on Lapua, it is BEAUTIFUL brass and makes an even MORE BEAUTIFUL pen. Where the military fired bullet pens have light scratches and ejector dents, these Lapua bullets are virtually blemish free. These brass cartridges are lightly polished to show lustre and shine and will beautifully patina over time. 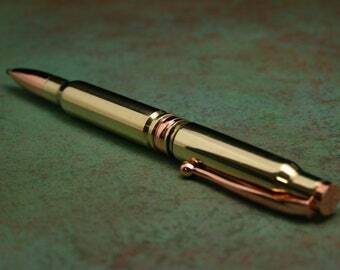 This smooth writing bullet pen will surely gather attention from others. Shipping by USPS First Class upgradable to Priority Mail. 15% off on select items until 4/30/2019. Very nice Pen, the only complaint, that came with some scratches here and there. Came so fast, and looks exactly as it does in the picture. My boyfriend loved it! Awesome pen. My husband loved it. Quick shipping. I am currently accepting PayPal as well as Etsy processing that will allow you to use a credit card as well as an Etsy Gift Card. I am confident you will be pleased with your newly handcrafted items but if there is an issue please contact me within 15 days of delivery and I will work with you in resolving the issue. If an item is damaged or lost in transit I will refund your money or replace the item with another like item once the USPS insurance monies are received. The problem with replacing, is each and every item is unique but I will work with you on helping you to decide. To help prevent any damages to your new handcrafted item, I pack them with as much care as possible. I ship all of my items via USPS First Class or Priority Mail with tracking. Insurance will be added to some items depending on their value. In most cases I get items shipped the same day (if ordered by noon Arizona Time), otherwise they will always go out within one business day. The pen is my art. The pen is my canvas and the acrylic or wood is my medium. Each and every item is unique and handmade. I try my best at producing a quality product and take my time in turning and polishing each pen to it meets my expectations to make sure it exceeds your expectations. I at this time do not handle custom orders. I put what I have made as it was made on Etsy. The item you see is the item you will get. My bullet pen tarnished, what can I use to polish it. Most people prefer the tarnished look but if you want to polish it, I personally prefer Cape Cod Polishing Cloths or Maas Metal Polish. Neither one are strong smelling. Try to keep the polish off of the colored parts (copper, gunmetal, etc) as those are coated to protect the finish. Real bullet pens: Pull the 2 halves apart (they are tight but they pull apart, try to not twist while pulling) and you can turn the threaded ink cartridge out and replace it with a standard Cross Refill. - Roller Ball Pens: Remove the cap from the pen turn the 'nib' (the part where the ink cartridge pokes out) and the ink cartridge and spring should come right out. Don't lose the spring as the replacement may not come with an extra. Ballpoint Pens: Most of these the 'nib' twists off (the part where the ink cartridge pokes out) and the ink cartridge and spring should come right out. Don't lose the spring as the new cartridge may not come with a new one. If your pen isn't mentioned here please send me a message and I will gladly help. All pens now come in a small black 8" x 2" gift box ready to wrap. If you select "send as gift" its all ready to go (minus the wrapping). We don't do wrapping at this time but this will be added as a feature in the real near future. 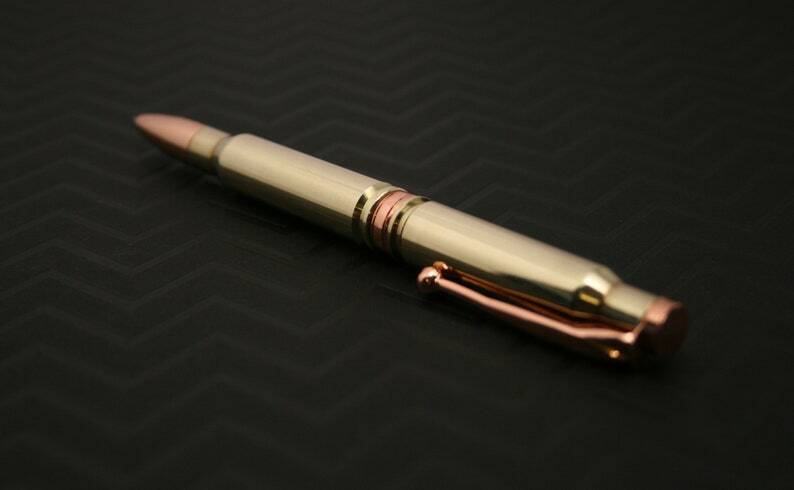 I up-cycle range fired and military fired brass to create my bullet pens. Most of them if not all of them have some type of marking showing such use. I believe, so do others, that is adds a character to them that represents what is is and its past. I do bring some of the smaller scratches out in the polishing process. Enjoy the pen as it is, it tells a story. I am planning to possibly adding some listings using new brass in the future that may have less marks and dings in them.